Though his legacy has long been a publishing phenomenon, yielding mountains of nonfiction ranging from the scholarly to the sensationalist, the practitioners of non-factual literature have always been strangely retiscent when it comes to the King… albeit with some exceptions. 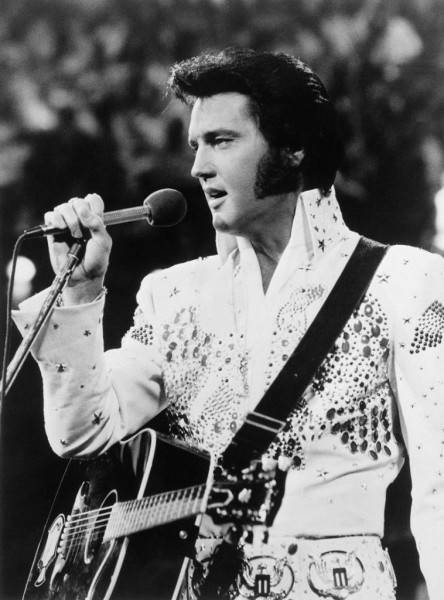 Perhaps – no fat jokes, please – Elvis is simply too big a subject for most writers to handle. The story of Elvis is, depending on your perspective, also the story of rock and roll, racial politics, Southern culture, drug addiction, the power of celebrity, the rise and fall of greatness, and the evolving nature of American identity in the 20th century. Despite the richness of such material, not many novelists have the stamina to tackle all that in one go. One might also argue that no fabrication could ever out-do the reality. A lot of cliches began with Elvis – ‘stranger than fiction’ might as well be one of them. Even the wildest imaginations of speculative literature failed to see Elvis coming, snake-hipped and gold-suited; now, almost 36 years after his death, the uniqueness of that character remains as embedded in the world’s consciousness as Adolf Hitler or Jesus Christ. Not bad for a guitar-strumming hillbilly. As diligent readers may have noticed, I have a certain regard for Mr Presley, otherwise known as the only King to whom I would ever bow. That regard extends to my bookshelf, where most of my fascinations live, so for anyone considering a literary exploration of Elvis, I am happy to offer the following selection. (Sadly, since the focus of this list is fiction, I am constrained from considering any of the excellent Elvis-themed cookbooks available to the discerning gourmet. As the world’s foremost expert on fried peanut butter-and-banana sandwiches, this breaks my clogged little heart). Genre-pulverising English humorist Robert Rankin recognised the epic possibilities of Elvis early in his career with Armageddon: The Musical. Although the King appears in every volume of the ‘Armageddon Trilogy’, it is here that Rankin rewrites the legend of Elvis for the first time, with mischievous abandon. In the year 2050, nuclear war has long since reduced the world to a radioactive wasteland. This is unfortunate on a number of levels, since aliens have been televising life on Earth for thousands of years, turning the events of our history into the galaxy’s best-loved soap opera. However, post-nuclear existence makes for pretty grim viewing and viewers are turning off in droves. The network’s solution? Skip back a hundred years and change the plot. Many will be familiar with the story of ‘Bubba Ho-Tep’ from Don Coscarelli’s 2002 film adaptation (starring Bruce Campbell in possibly his greatest performance), but the original novella is still well worth picking up, offering as good an introduction as any to Lansdale’s trademark world of sardonic phantasmagoria. Like Rankin, Lansdale has enormous fun putting Elvis in a fantastical context, which is really the only kind of environment that seems to suit his larger-than-life persona. Yet ‘Bubba Ho-Tep’ is also one of the sweetest and most melancholy examinations of Elvis in fiction, crediting him with a great deal more depth than many of his portrayals. Simon Crump’s collection of Elvis-themed short stories highlights the weird, semi-religious ethereality of Elvis’s place in pop culture, then sets that image ablaze with iconoclastic glee. Here we have Elvis the saint, Elvis the mental patient and Elvis the mass murderer, paranoid, psychotic and drenched in the blood of his enemies, more than a match for anything the world can throw at him. A thrillingly disturbing little book, My Elvis Blackout is a study in contrasts and amalgamations, with stories that dance between fact and fiction, the surrealism of Crump’s prose melding with the surrealism of Elvis’s life, the tone skipping between blackest humour and disconcerting seriousness. Full confession: I haven’t actually read this one yet, but I badly want to, for reasons which can be best summed up in its original title: Tarzan Presley. First published in 2004, Cox’s novel mixes the mythology of two legends, and dares to imagine that the lord of the jungle and the king of rock and roll were one and the same. Personally, I cannot imagine any set of circumstances where such a combination does not result in pure joy.